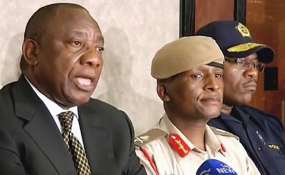 Facilitator Cyril Ramaphosa announces that rival security chiefs, Lieutenant General Tlali Kamoli of the Lesotho Defence Force, centre, and Police Commissioner Khothatso Tsooana, right, will both take a leave of absence. Cape Town — The leaders of Lesotho's coalition government have agreed on a timetable for resuming sittings of the country's Parliament. And the country's Prime Minister, Tom Thabane is reported in Maseru to be "coming home" after fleeing to South Africa when troops left their barracks at the weekend and briefly seized police facilities. At the end of talks with southern African leaders in Pretoria on Monday, the coalition leaders and the region's security arm issued a joint statement saying the Basotho leaders would "expeditiously" implement a decision to "remove" a proclamation - initiated by the Prime Minister, Tom Thabane - to prorogue (suspend) Parliament for nine months. The coalition leaders said they agreed on a "roadmap with clear timelines on how to remove the Parliament prorogation, which shall be submitted to the King [Letsie III]," the statement said. It added: "The leaders further agreed to issue a joint statement appealing for calm and exercise restraint with a view to rapidly bring law and order back in the Kingdom." Lesotho's latest political crisis was set off when Thabane, facing a vote of no confidence, suspended Parliament in June. After months of feuding within the coalition - particularly between Thabane's All Basotho Congress (ABC) and the second-biggest party, the Lesotho Congress of Democrats (LCD) - the LCD signalled its intention of instead forming a new coalition with the Democratic Congress of the last prime minister, Pakalitha Mosisili. Unless the current coalition leaders reach a new rapprochement before Parliament sits again, the country could see a new coalition, headed by Mosisili, and with Thabane on the opposition benches.